We don’t know each other. In fact, until several weeks ago, I had never heard of you. It was a very striking, newsworthy cover because you are 5ft 3in and weigh over 300lbs. As such, you are someone suffering from morbid obesity. That’s not me being a ‘fat-shaming douchebag’, as your legion of fans will doubtless immediately scream. The medical establishment gives that definition to anyone who is more than 100lbs overweight or has a BMI (Body Mass Index - the ratio of an individual’s height to his or her weight) of 40 or more. Morbid obesity, as its name suggests, is a very serious health condition. Those who are diagnosed with it are at greater risk for illnesses including diabetes, high blood pressure, gallstones, osteoarthritis, heart disease and cancer. In other words, it can kill you. What a load of absolute nonsense. As with size zero models, your body image is one that people – not least yourself - should be deterred from celebrating because it’s unhealthy. I can understand the desire to do that. Sorry, Tess, and I say this with great respect, but I just don’t believe you. Nobody, male or female, could see their weight surge to over 300lbs if they’re just 5ft 3in tall, and be genuinely happy. Right now, I think you’re trapped in a hellish spiral of self-delusion in which your soaring fame and fortune is entirely dependent on you remaining morbidly obese. 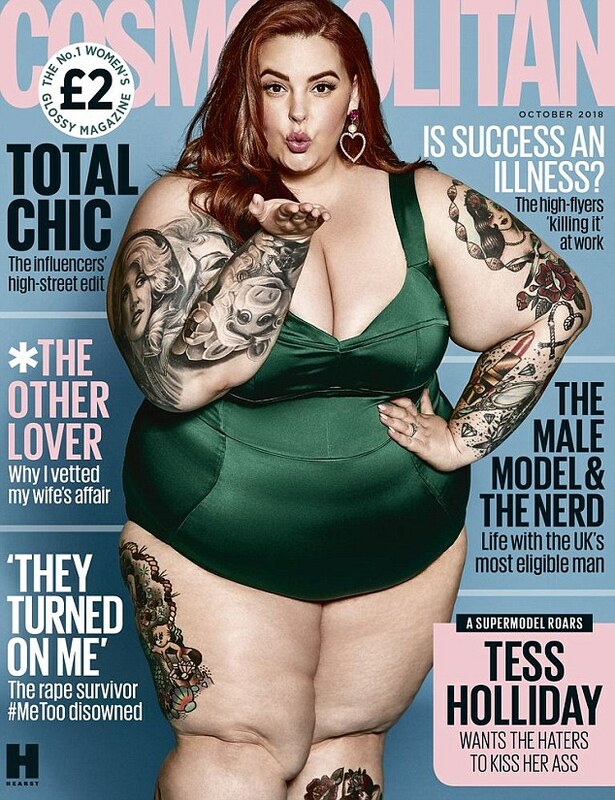 You’re only getting the cover of Cosmo and endless TV appearances because you’re massively, dangerously overweight yet feigning joy. In your heart, you must know this? The editors and producers paying you large sums of money to glamourize your morbid obesity are cynically exploiting you. Before you ask, I’m no body perfect myself. I’m 6ft 1in and weigh around 215bs. My doctor says I’m reasonably fit for a man of 53, but he’d like to see me get under 200lbs. That’s why I work out three or four times week, and am being more careful what I eat and drink. Unlike you, when I see a fat-looking photo of myself, I don’t cheer, I cringe. But the first step is brutal honesty. In Britain, a well-known politician named Tom Watson has just revealed how he lost more than 100lbs in the past year by cutting out a lot of stuff he loves – sugar, bread, cheese, beer etc – and working out. By doing so, he has actually reversed his Type 2 Diabetes. It was being diagnosed with that condition in 2015 that compelled him to take dramatic action to change his lifestyle. He didn’t do anything immediately. He admits that his early workouts were ‘humiliating and pathetic’. You should believe him, too, and stop believing your enablers. More importantly, stop lying to yourself, Tess. You have two young sons; one of 13, the other just two years old. They need you to stay alive and be their mum. Sorry if that sounds harsh, but it’s the truth and it’s time you faced up to it. On Tuesday, you posted a very unedifying semi-naked Instagram photo of yourself to your 1.7 million followers. The friend that told you to write that caption is plus-sized rapper Lizzo, who doubtless cheered you on when she saw it. But when I saw your photo, which quickly went viral on Twitter, my heart sank. OK, well first, I love women of all shapes and sizes. Second, I’m not obsessed with you, I’m worried about you. We can keep having a pop at each other on Twitter, and fuel the supposed ‘feud’ between us. But ultimately, I’m not criticising you for a bit of social media fun or to score a few cheap points at your expense. I’m doing it because I genuinely feel you are promoting a very dangerous message, and because I am genuinely concerned that your own life will be in danger if you continue down this path. If your own friends are telling you that you look ‘damn good’ in a photo that is so obviously deeply unflattering, then as I said, you need better friends. A real friend would be telling you what I am telling you. Tess, the most inspirational thing you could do right now is start to LOSE weight, not put even more on. Imagine what a powerful message it would send to the millions of other Americans with morbid obesity if you could do what Tom Watson has done? The bottom line is that there’s nothing remotely powerful or inspiring about a 5ft 3in person breaking the scales at 300lbs. It’s just a guaranteed pathway to sickness, misery and possible death. So I urge you to stop pretending your body is radiating some great ‘positive image’ to the world. Wake up, shape up and be the brilliant role model you COULD be if you just stopped listening to those fools who want to celebrate your morbid obesity. You can do it, and I will be the first to salute, and celebrate you if you do.